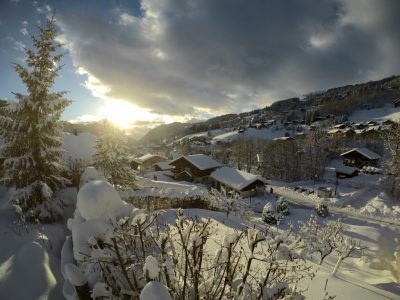 RushAdventures Ski Holidays offer you affordable accommodation in the heart of Les Gets. Next to the ski lifts / pistes and close to the village centre shops, bars and cafes. All our catered chalets offer a first class service with delicious home cooked meals served each night. Our staff are here to make sure you have an unforgettable ski holiday in Les Gets. Located in the village of Les Gets and just one hundred metres from the ski slopes and ski lifts, Chalet Aventure offers real comforts with five ensuite bedrooms, a spacious open plan lounge and dining room, large private garden area with outdoor hot tub and views of the mountains, pistes, pine forests and the stunning views looking down the valley. Ideal for family groups or mixed groups looking for a good location next to the ski slopes. 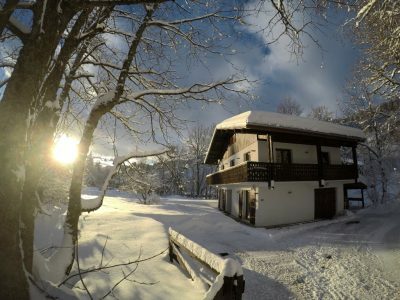 Located very close to the ski pistes, ski lift and designated tobogganing area, Chalet Fram offers real luxuries with its large private gardens, sauna and beautiful wood decor. Recently fully renovated inside and out, The Chalet offers five beautiful mostly ensuite bedrooms with the option of double or twin bed setup. There is a large log fire in the open plan lounge, dining and kitchen area with amazing panoramic views from the patio windows.